The section of the Houghton Heritage Society website looks at the people and characters from Houghton-le-Spring. Many will remember the faces shown below, such as Tommy Urwin the local MP, or Colombo Riani from Riani's Cafe, but some may be more obscure - or perhaps you have heard of them but wondered what their connection to Houghton was. If you can think of any individuals who should be included here, please do get in touch with the Society. 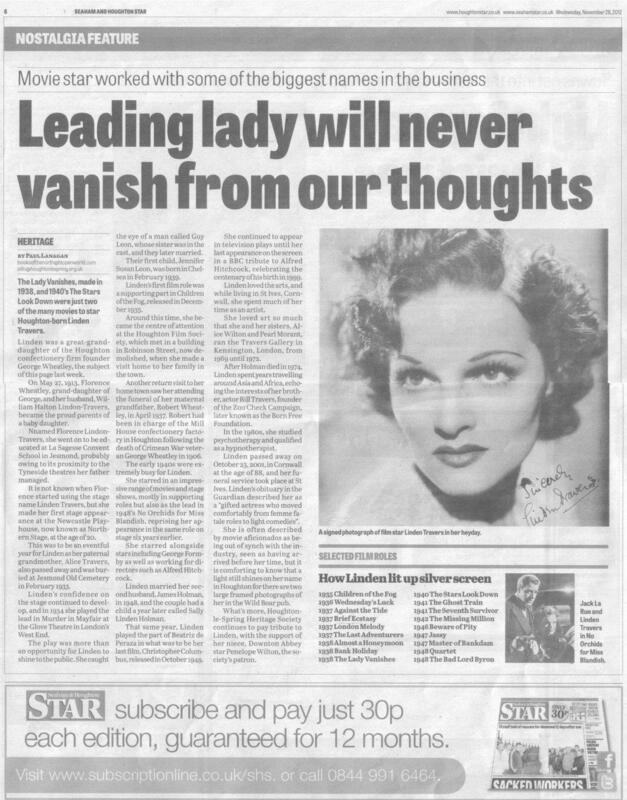 Linden Travers, star of stage and screen, was born in Houghton-le-Spring in 1913 as Florence Lindon-Travers, daughter of William Halton Lindon-Travers and Florence Wheatley of the well-known confectioner family. 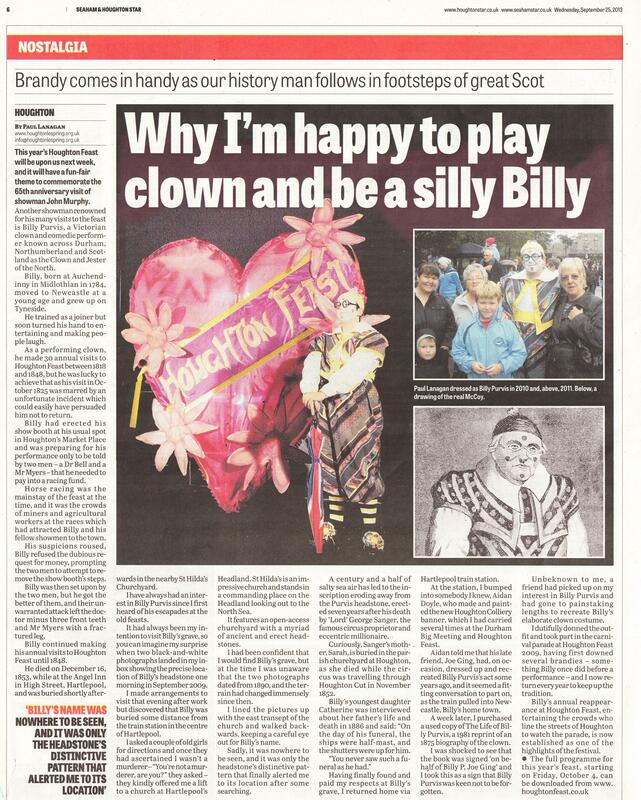 Mr John Mawston also goes by the name of Mr Houghton Feast for his longstanding association with the festival. John was a Councillor for Houghton Urban District Council and then the City of Sunderland. Bernard Gilpin was Rector of Houghton-le-Spring from 1558 until his death in March 1583 at the age of 66 years. 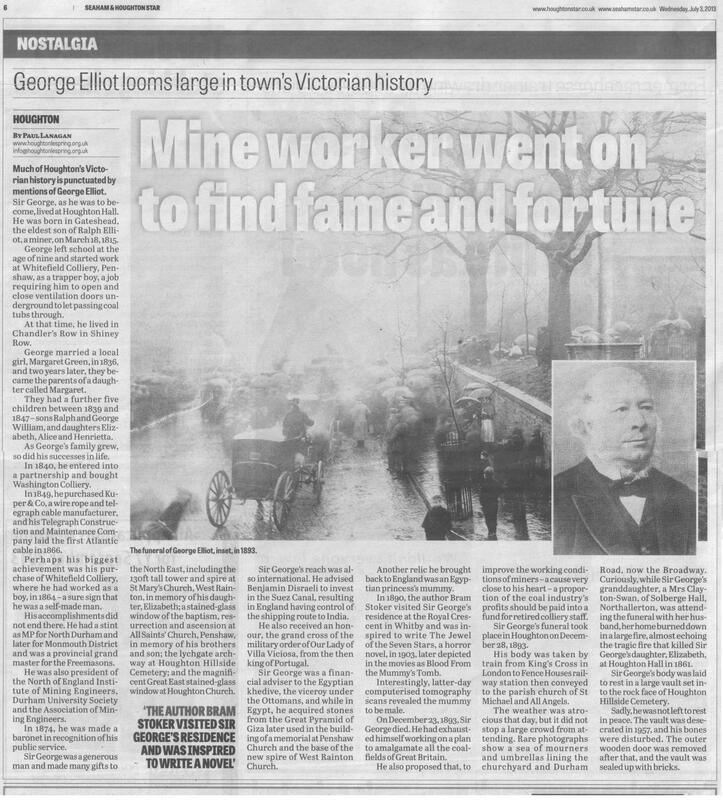 Find our more about this amazing man in his own section of the Heritage Society's site on the link below. Margery Bellasis was a friend of Bernard Gilpin's. She had 12 children! Margery is interred in a tomb in St Michael's Church, set in the south wall of the Chancel. An engraved brass plate once marked the spot. Originally known as the Gaiety Temperance Bar, Riani's Cafe was located at 67 Newbottle Street and was owned by Colombo and Alessandro Riani, two brothers from Castelnuovo di Garfagnana, Tuscany. Sir George Elliot, Bart, MP, lived at Houghton Hall. He was an advisor to the Egyptian Khedive. He is buried in the large rock vault at Hillside Cemetery with his daughter Elizabeth, son and grandson (both George). Sir John le Spring, Lord of Houghton, was killed in his own manor house, in the Market Place of Houghton-le-Spring, in 1313, by Robert Lascelles, the husband of Sir John’s lover! Read this fictional retelling of the murder. William Shanks, a thirty-five year old amateur mathematician from Corsenside, came to settle in Houghton-le-Spring in 1847. 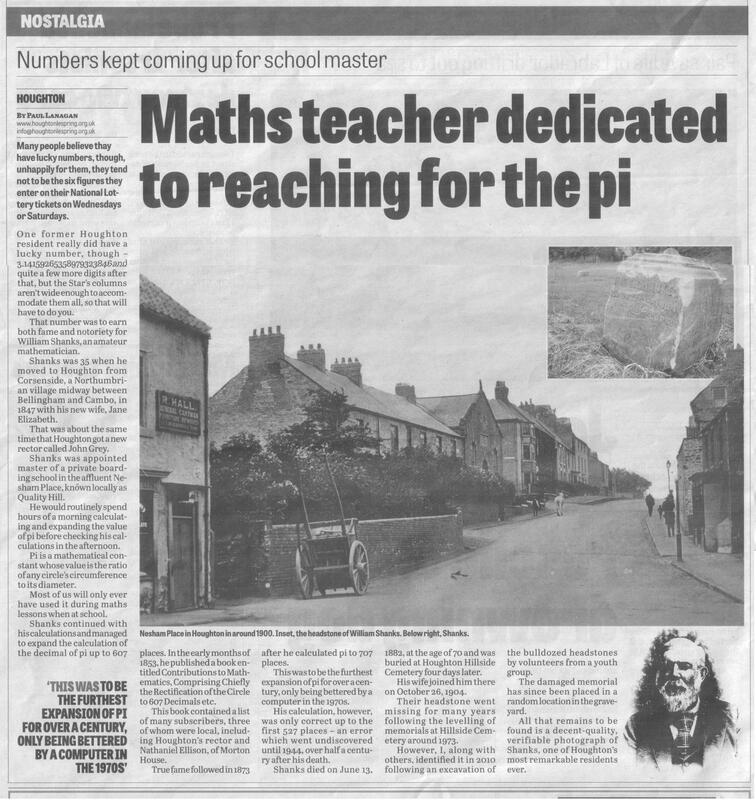 William is famous for calculating the value of Pi to 707 places. The great showman Billy Purvis visited the Feast with his booth between 1818 and 1848. He made a welcome 'reappearance' in 2009 and has been back every year since. Read his fascinating story here. Reginald Vardy was born at 13 Union Street, Houghton, in 1909, the son of a coal miner. Reg's son, Peter, took over his car dealership in 1976 and grew it into one of the most successful in the volume car market. Thomas William Urwin (June 9th 1912 – December 14th 1985) was a Labour Member of Parliament for Houghton-le-Spring between 1964 and 1983. He served time as a Councillor on Houghton Urban District Council. Elizabeth Porter, of Shiney Row, was Chairman of HUDC in 1970 and Mayor of Sunderland Borough in 1975, the first female to take the role. Mrs Porter passed away on June 25th 2011 at the age of 101 years. Houghton Heritage Society's YouTube Channel features exclusive videos of Houghton-le-Spring as well as footage from our heritage events throughout the year - and of course scenes from the annual Houghton Feast!